The second sporting experience of the weekend in Gwangju was a trip to the baseball and a chance to visit the only stadium in the Korean baseball league that I hadn’t yet been to. First though, Jen and I paid a visit the May 18th Cemetery. You might be aware that there was an uprising in Gwangju against the military dictatorship during May 1980 and that over two hundred protestors were killed as troops were sent in to re-establish their authority. 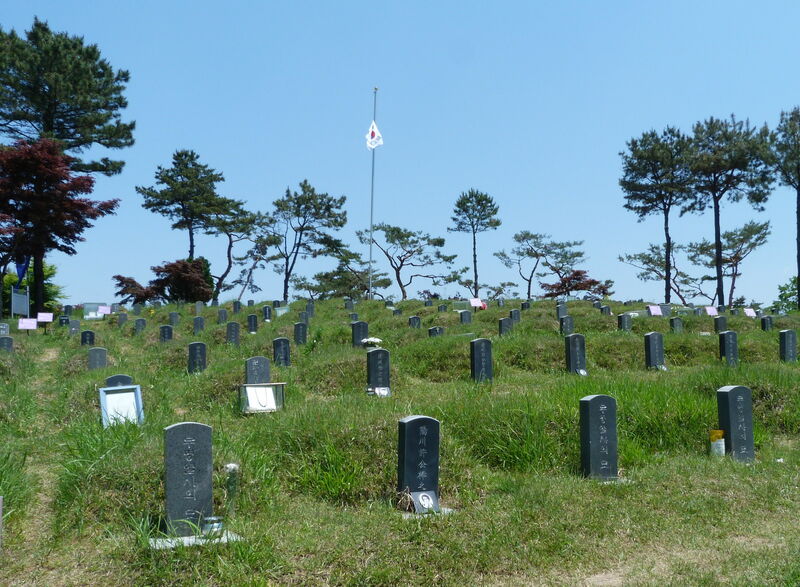 The bodies were hastily buried in the Magwol-dong cemetery and then a few years later when democracy had been restored the bodies were exhumed and re-buried in the new National 18th May Cemetery. 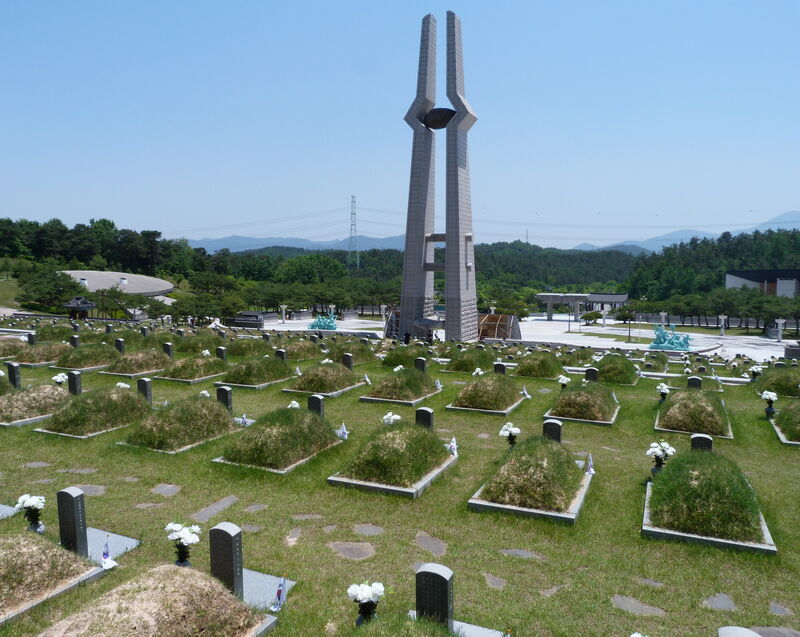 In addition to those who were killed at the time, anyone who survived the protests can choose to be buried in the cemetery when their time is up. 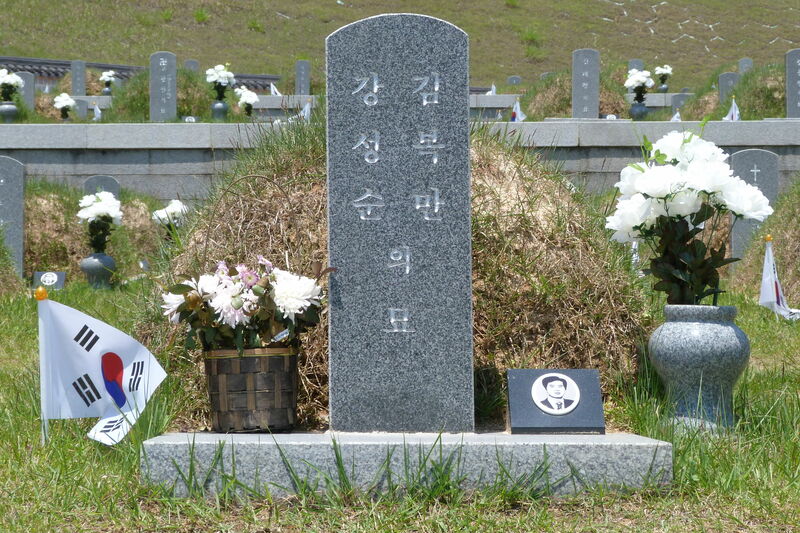 Most of the graves have a photo of their occupant as well as their dates of birth and death. Some were small children, others old men, but most were students. Most of the graves were similarly decorated. The old cemetery where the bodies had originally been buried has been kept just as it was in 1980 despite the exhumations. As the old and the new places are only ten minutes walk apart we were able to have a look at both of them and then also the exhibition hall that details what went on. If you like cemeteries or want a bit of an insight into the events of May 1980, it’s well worth a visit. You can catch the 518 bus there and back from just about all over Gwangju, including the bus and train station. We got back into town at about quarter to four and after stocking up with a few cans we hopped into a taxi at the bus station. There was already a large crowd outside of the baseball stadium and it soon became apparent that the game had already sold out. We struggled a bit at first to find a tout but ended up with two 8,000 won outfield tickets for a total price of 30,000 won. Despite there still being an hour to go to the start a lot of the areas inside were filling up. We managed to find a couple of seats just to the right of the scoreboard where we didn’t have to watch through a fence. 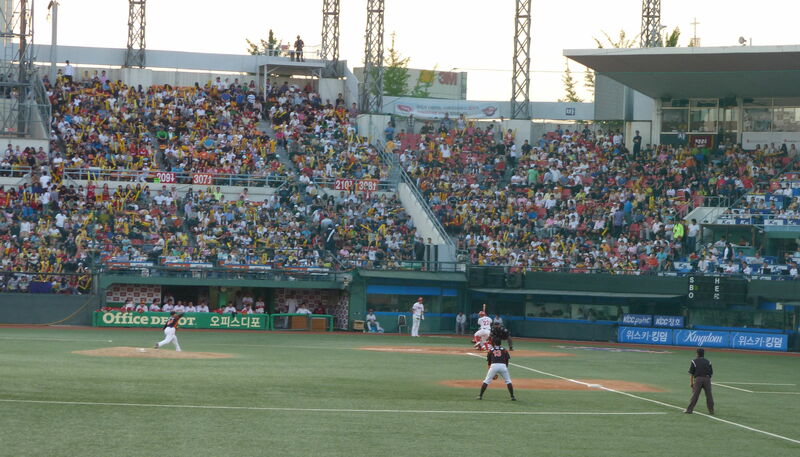 The stadium was smaller than I’d imagined and we didn’t see any Lotte fans at all. Strange really, as they seem to have travelled in large numbers to other places I’ve been. 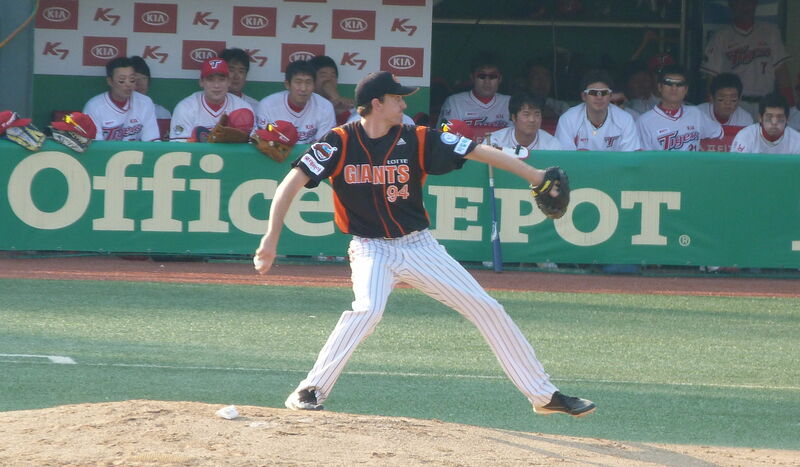 Ryan Sadowski was the starting pitcher for Lotte. We’d watched him warming up near to us and Jen had identified him from the Japanese handbook the bloke next to us was using to shield his eyes from the sun. Ryan looked better warming up than he did when he was playing though and when the game started he didn’t have a particularly easy time. He was pulled early in the fourth innings after having been whacked all over the stadium for seven runs. 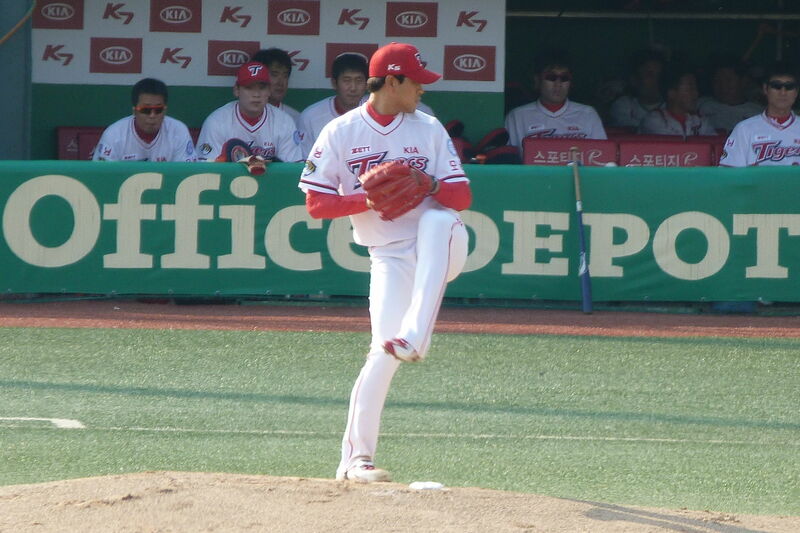 The opening pitcher for Kia, Son Yeong Min, didn’t do a lot better. At least not in terms of sticking around and was also replaced after three innings. At least by that stage he had only conceded a single run. It was the seventh innings before Kia conceded their second run and I reckon that by that time he will have been showered, changed and down the pub. 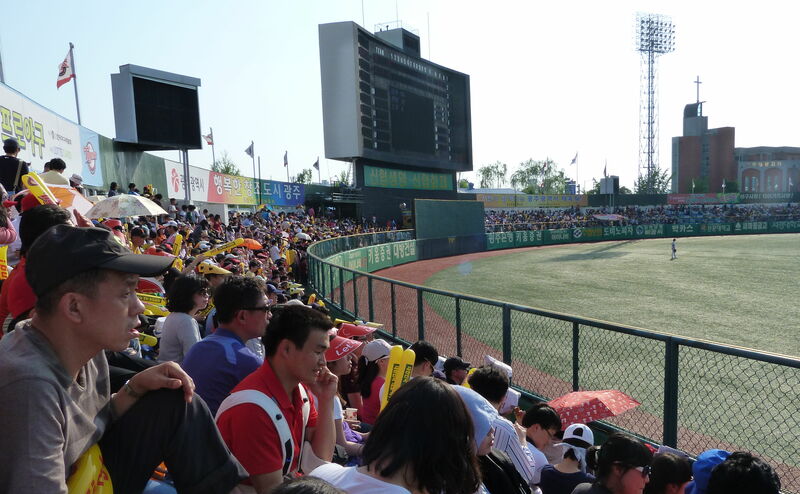 The player who really got the home crowd going though was first baseman ‘Big Choi.’ At Gunsan the previous week the fans had a song for him to the tune of YMCA. Here they seemed to have a different chant every time he appeared. He’s one of those players that always seems to be up to something and a natural centre of attention. He managed to make his way around for a run and got the sort of reception that couldn’t have been any better had he stopped halfway to put out a fire at an orphanage. Big Choi rounds third base. Jen and I left at quarter past seven to catch our train. We could probably have squeezed another fifteen minutes in, but three hours in the hot sun was enough. 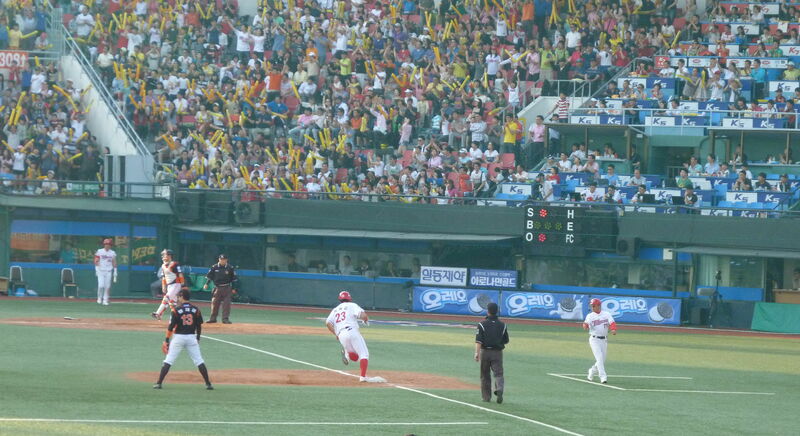 We got the KTX back to Yongsan whilst Kia held off a late Lotte fightback to take the game 7-5.